Dairies can be all sizes, shapes and forms. If you're like me, you usually think of the Northern part of the United States when you think of dairies. However, New Mexico is number 7 in the USA in terms of milk production. New Mexico and 9 other states account for 71% of milk produced in the US according to a 2005 report from New Mexico State University. With all those animals, it takes a tremendous amount of inputs and resources to manage them properly. Our photo on the top is a large dairy that has about 20,000 animals, with about 16,000 of them being milked on a daily basis. There are 4 other dairies nearby, but this is by far the largest in this area. We are working with the dairy on a couple areas. They have several thousand acres where they grow some of the feed needed for the animals. These crops include alfalfa, milo, and triticale. 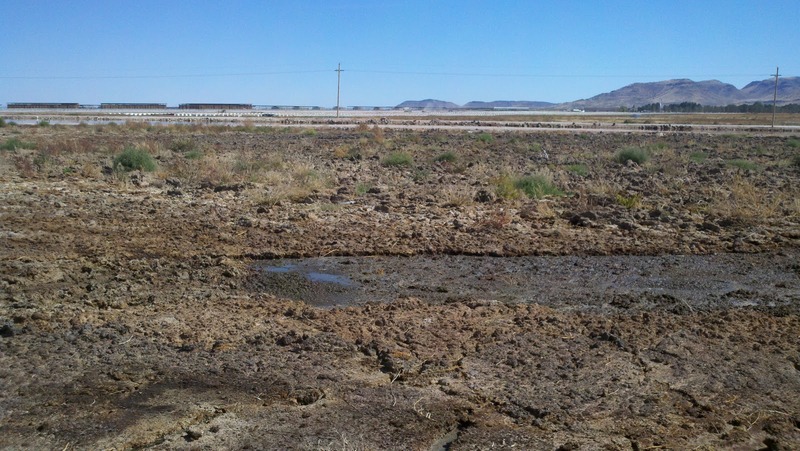 The soils in Southern New Mexico are very salty and rocky in this particular area (between Hatch and Deming). We are injecting Activated EM•1® in all their fields, starting now. Over the course of the winter, we should start to see some major improvements in the ground. Of major interest on any dairy is how to get rid of all the waste. I've included several photos the lagoons we are now treating. The first lagoon (primary lagoon) receives all of the liquid wastes from the 8 milking areas (parlors). 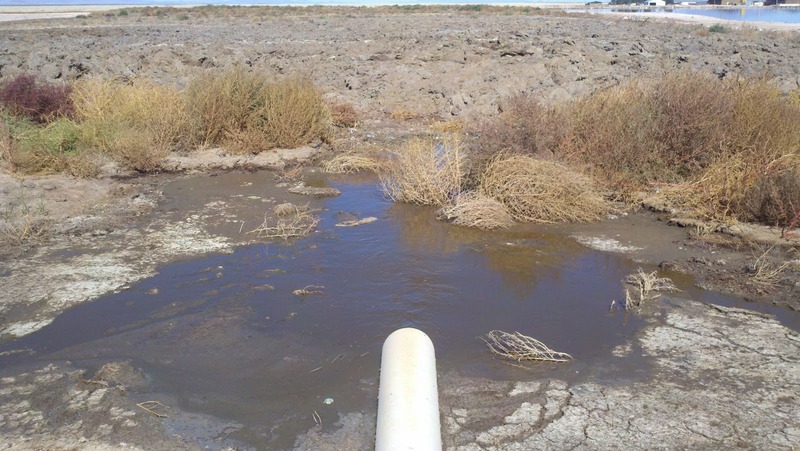 The waste flows from the primary into a secondary lagoon (there are 4 other secondary lagoons and one that is not in use at this time). Some of the water from the secondary lagoon is used to flow areas in the buildings and flows back into the primary lagoon. The second picture above is of the primary lagoon. These lagoons are massive! They are about 25-30 feet deep with about 5 acres of surface are (325Kx5x25=40.6 Million Gallons each). The primary lagoon is a mass of solids. As you can see from our first set of photos taken in early October 2010, there does not seem to be any water on the surface...except at the inlet (picture 3). This was taken 3 weeks into treatment. It is generally thought that it is good to have a crust on the lagoons to keep the odors under cover. So, this is not too unusual of a sight on a lagoon. Here is a shot of the secondary lagoon in early October 2010. The water is brown with a little red/purple color to it, which does not show up too well in the pictures. Just to give some perspective, this is what an empty lagoon looks like. This one is directly to the South of the Primary lagoon. On the upper left, you can see the influent pipe. It is about 15 feet above the ground. October 28th, 2010. We're starting to see some action on the surface of the primary lagoon. Liquid is bubbling up. We all took note that there was no noticeable odors around the lagoons in spite of more liquids. Additionally, the volume of material above the level line has decreased by about 50%. This means the material below is digesting at a very fast pace. More liquid is visible on the surface in other areas around the primary lagoon. 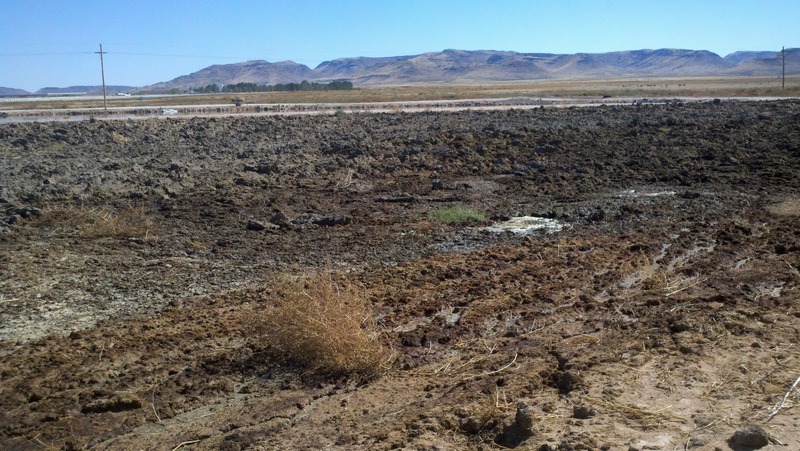 Be on the lookout for more updates as we continue to treat this dairy lagoon in Southern New Mexico.